Sometimes it gets me in its clutches, that CBF mood, like Gollum with his Precious, it stalks me and does crazy things until I submit. CBF, by the way, is Can't Be Bothered's vulgar, bullying, older brother. You've probably met him. He's an expensive house guest to have, forcing me to buy takeaways instead of cooking inexpensive, nutritious meals. He won't let me go to the gym, even though I've paid for it already. He turns molehills into mountains in the laundry and every flat surface in the house. This isn't procrastination. 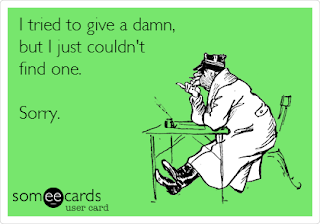 I'm not putting things off for later; it's genuine apathy. And because I don't want to waste a ton of money on this CBF mood that doesn't deserve to be on the payroll, I decided to have a think as to how I could get the most out of doing as little as possible. Obviously the takeaways are something I'd rather avoid, but the crock-pot is my friend. I'm going to do something like this. Proof that it's a CBF day is that I'm linking you to something that's similar to what I'll do, but not the same. I have my own ideas and twists, and while I'll make several meals, it won't be these ones. The mince and lentils part will be the same, but that's about all. I just CBF writing it down. I'm really sorry. Maybe another day. And then I'll be sorted for a few days, just in case. Also, it cuts back on dishes. After that, I'm going to snuggle up in bed with some story books and the wriggly three year old and read until he falls asleep and then fall asleep myself. Then maybe when I wake up, I'll feel like being productive. There are times, in my role as mother, when I'm not the wonderfully empathic, serene, understanding, personification of perfection I'd have you all believe. I know, right? Who could have seen that coming? Ahh kids. Always so completely honest. And blunt. You don't get to be an arse in my house and expect to get away with it. They have dispersed from the lounge, however. They don't want to risk standing on my land mines and have me project my frustration into them a little more. You see, I had decided to write about some projecting that was happening last night. One of my kids has fears that are irrational. Big fears. I find it impossible to validate them, because I feel they're invalid (they are valid because they are unresolved from a time when validity wasn't in question). So it's basically my fault they're still happening now, and weren't resolved half a dozen years ago, when they would have been more understandable, but unfortunately I was less emotionally aware. I try now to be more understanding, but I have to fight down my feelings of disgust. And that's a really cruel thing for a kid to deal with, even if he only knows in a subconscious "Mum's not being genuine in her concern" sorta way. So he doesn't come to me with his pain, he goes to Mr. Me, and that triggers me too, because then I feel not good enough. It's all my own trash-bag of emotional garbage that I'm carrying around, and the projection part is me saying "here, I'm tired, you carry this for a while." It's completely unfair, but I want to do it anyway. We all do from time to time. Random small boy and his father are playing in the park. All is well and fun until the small boy falls from a swing and begins to cry. Father is immediately disgusted and ashamed because he was made to feel shame about crying when he was small. Father picks up small boy and tells him he's not a baby and to stop crying. Small boy now feels shame, and his father less so. The father has projected his shame into his son. It's not the son's shame. It's most probably not even the father's, or his father's. It's hand-me-downs, inherited through generations, and now the small boy gets to carry it in his trash-bag of emotional garbage too. So last night, it was all I could do to just not pass on my emotional baggage by going to bed early and talking to no one. It's pretty much all I could do before to ask politely to be left alone, even though I'm in a communal room and everyone else has important things they're using it for too. And I wonder how common an occurrence this is, when we feel like punishing our children for things completely outside their field for blame. There are a lot of very public examples of projection that have been normalised. I think Prime Minister John Key and his gay red top comment was a good example of projection, which needed to be addressed. Why else but because of his own discomfort would he be so publicly offensive? It's certain he's been well taught in the art of interview, speaking publicly and being politically correct, even if he doesn't think that way, as all politicians must have to reach as high an office as he has. It's all the more obvious because he's trying to rationalise it as well! Someone who makes a genuine mistake doesn't try to do that. So, if we're going to raise healthy children, we need to get rid of this projection business. We don't have a right to pass on hate and bigotry, or in my case disgust at fear and slow-learning. Children have enough emotional baggage of their own to carry without carrying ours too. My latest lot of seeds was bought on an on line auction. The price was great, the seeds were plenty and I could get a good 80% of the varieties I wanted from the same person. Win! I knew they were home collected seeds, so maybe they wouldn't be as stringently quality controlled as if I bought a commercial packet, but they were a third of the price and five times the quantity, so if there's a misfire, I'm not going to sob over it. 1) A bible quote in each packet (alright, if that's your thing). 2) A caveat stating that if I planted on a full moon, I might only get 25% germination rate, but if I planted on a new moon, the rate would be around 90%. The second one sounds a bit loony to me. (Yes I said loony on purpose: Luna/loony. Yes, I thought it was funny, yes you're supposed to laugh. Please laugh now at my weak etymological joke, OK? Cheers.) I've heard of planting by the moon before though, so I figured I'd at least look it up. Without looking it up though, I'm not really convinced. If this were the case, surely seed production companies would have it written on their packets? They want you to believe they have the best quality products, so if you only get a 25% germination rate, maybe you'll try another brand if you don't know about this lunar stuff. Another thing is, when I did look it up on line, most of what I saw said that, if anything, the opposite was true. Full moons apparently pull more water to the surface of the earth, where seeds and roots live, and so more growth happens. But it's purely a water thing, and I plan on watering my seeds well whatever time of the month I plant them. So I'm going to do an incredibly basic experiment, just to check. The next new moon is Wednesday the 14th, so I'm going to plant radishes. I'll plant them in a recycled egg tray that holds 30, and put 1 seed in each compartment, then count the germination rate, speed and overall growth rate. I'm choosing radishes because they're just so darned quick and easy to grow, and we could probably manage to eat 30 radishes every two weeks once they're ready, without straining ourselves. Also, hopefully they'll be happy enough in the small amount of space an egg carton affords. If not, oh well. I'll repeat it in a couple of weeks when there's a full moon, and then again during the next new moon just because there may be a temperature issue since we're moving into summer and I want to rule that out. It's not a perfect experiment, since the weather won't be a constant, but it'll probably be enough to convince me if there's anything significant about the idea enough to make me change my current "plant any old time" practices. In the mean time, if anybody out there plants by the moon, I'd love to hear your experiences! Let me know either on facebook, or in the comments section below. for you to see that bit of me. Many people would say she's ruined. She's seen better days, sure. She's stretched, and warped in odd directions, her colours have faded, and she looks sad. Quite honestly, I don't even look at her much any more and I think about her less often. She's just... y'know... there. Like the old Coca-Cola sign, faded and tattered above the derelict corner shop where you bought ice creams 20 years ago. Quietly waiting, but bursting with memories. Every glance a different association. She has her story too. I have a theory about tattoos. (I say 'I', but I really mean 'we'. Mr. Me and I have mused over this intermittently for a few years now, but for these purposes I'm taking credit; I'm sure he'd do the same.) The theory is, that which we permanently apply to our skin is likely a metaphor, or even a direct screaming of our innermost feelings. And it could perhaps go one of two ways. Taking for instance, those who tattoo their babies' names and birthdates on themselves. They may be doing it because they have so much emotion and pride, they need to permanently put it out there. Or they may care very little, feel guilty about that, and ink themselves to try to assuage the guilt. The beauty is, only the owner truly knows the reason, so there's still hiding to be had if it's wanted. 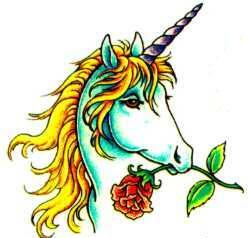 Last night I lay awake and thought of my Unicorn. What did she mean then, and is she still relevant to me now? I'm going to be honest with you here, I really didn't put a lot of thought into what I would get done when my friend and I decided we'd get tattoos together 16 years ago. I loved horses and so I had a vague notion that it would maybe be of the equine variety. Also, I had decided it would not cost me more than $50, and that's what I took with me in cash. There was nothing in their pictures that I wanted... Except my wee unicorn. And she was $120. Well, it wasn't as if I was painting my wall and could change later, was it? I borrowed the balance from my friend and never regretted it. Still, what did she mean? When I look at her now, I am reminded of how she was. Fine, delicate lines. Colourful, wild, feminine, strong... Such a mythical creature couldn't possibly exist, but there she was. And when I think about it: that's how I felt about myself. I was young and strong, almost arrogantly confidant about who I was and what I could do. And at the same time, I was feminine and delicate and empathetic. I felt beautiful. Is she still relevant to me? You can see she's been in the wars. She has hugged three children close as they grew strong enough to be born, and paid the price. She has expanded against her will as I have expanded and contracted over the years. She has battled with me. Just like when you see the weathered coca-cola sign you think fondly of the summers of your youth, when I see my Unicorn, I'm reminded of the real her: courageous and full of self worth. And she in turn reminds me of the real me. The one I very often forget exists. The me who has been stretched and warped and feels blurred and faded and sometimes, so very very sad. She knows me. Yes she's relevant. I love her. Purple Carrots Still Taste Like Carrots. I don't have a whole lot to say today. Actually, that's not true, and you know it. I'm as opinionated and yappy about it as they come, so I'm not going to try to convince you there's ever a time when it's otherwise. But the contents of my brain are a bit like freshly shorn sheep's wool: a valuable resource just waiting to be used, but first you have to clean it up, card out the fibres and then spin it into something people can use. And that takes a bit of work. Work which I've not yet done. Introverts need a fair bit of alone time to process everything that has gone on, and let their conscious mind catch up with the information their subconscious takes in. And it takes in a lot! I haven't had a lot of alone time over the past few days. I like alone time. I have alone time now. I'm going to use it to garden and other simple tasks that allow me to get lost in thought. Just as soon as I've finished here. I've already done a little of that. Spent a tiny 10 minutes or so admiring my growing vegetables. I picked some baby carrots. We're growing "Purple Haze", because, well, with a name like that, how could you not? But they seem to be a favourite of birds too (as seedlings) so there's some thinking to be done about that too. Anyway, where was I? Oh yeah, picking baby carrots. So I pulled a few up, just to try. They were about 3 inches long, and very definitely purple. I was excited to try them, having never seen carrots of a different colour, and I gave one to the smallest in the family, who was nearby too. I don't know what I was expecting. Evidently, I wasn't expecting carrot flavoured carrots! Did I think they'd be boysenberry flavoured because they're the same colour? (I think there's a deep and meaningful blog post in there somewhere too, but it's still immersed in the raw wool). Nope. 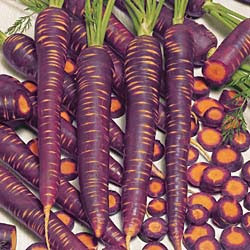 Purple carrots taste just like carrots. Who could have predicted that? Sometimes I just can't believe myself. I've never been a really big fan of school. I was good at it. Very good (no false modesty here). But I didn't enjoy it, and I left as soon as it was legal to do so. 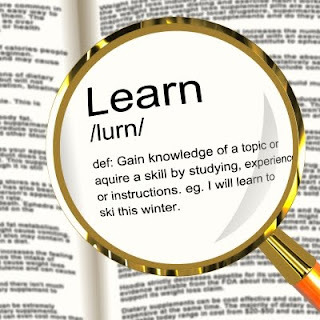 I left with Dad's blessing on the understanding that if I was leaving school, then I'd need to still be doing "something" and I immediately enrolled in an adult learning course anyway. It wasn't the learning that I needed to get away from. When my teachers discovered my intent to leave, there was a little bit of a fuss made. Like I said, I was "good at school". That kid in the top stream class who could consistently get high marks without trying, who very rarely disrupted the others, who was polite, and who was coordinated and fit enough to generally be one of the first picked in sports. They wanted me to stay. They didn't tell me that, though. They had the opportunity; I needed to go around each of my teachers to return my text books and ask them to sign my leaving form. Not one of them said anything then. But apparently they did in the staff room, because that evening my chemistry teacher, speaking for all my other teachers, telephoned my father and proceeded to try to convince him to make me stay at school. This was one of the moments Dad got really, really right. He said: "It's not me you should be discussing this with," and handed the phone over. Because, even though Dad would have preferred I stay at school, he knew that it wasn't him and the teacher against me but that I was a person with my own autonomy and preferences, and that to force me into something would only breed resentment. It probably would have hurt my love of learning too. Now it's my daughter's turn at highschool. She's nearing the end of her second year, and already she's hanging out for age 16 when it's legal for her to leave. She already knows what she wants to do, the learning she wants to move directly into and the places she'll apply to. She gazes at their pages on the internet often. Over the weekend, she brought up with Mr. Me and I that she was having a lot of trouble learning in class because of disruptions from other students. She's not in one of the higher streams, and a good many of the children are there under duress. So we asked her to speak to her teachers, get their email addresses, give them hers and ours and to ask for ideas of what she'll be tested on and perhaps some exam papers from previous years to practice with. And she has one teacher willing to help. Who sees her as a person in her own right. Who instead of getting in touch with us, has emailed our daughter with all the information she needs, and offered to answer any questions she may have, or clarifications she may need via email as well as in class. Our daughter spent the evening trawling through all this information with no encouragement from us. Independently learning. Her other teachers just saw a kid who had non-regulation shoes on, and took the time to email us about that, but nothing to do with her learning. Apparently what's important is a united front between teachers and parents. Apparently that's how we keep 'em in line. A united front and conformity. I'm told that the common response from one of these teachers whenever the kids remark that they're not learning anything is: You don't know how hard it is to be a teacher. It may be hard, but I believe the ones that manage it best are the ones who stop seeing their class as cats to be herded, but as a group of individuals to be respected and helped to learn in the subject you yourself are passionate about. I appreciate that he did care enough to phone, and he did try to talk me out of it. It wasn't enough, but I really do appreciate the effort. And if I could have a do-over, I wouldn't change a thing. Imagine you're walking down the street with two friends on a calm, overcast autumn day. There's hardly any traffic. A girl you know, about 14 years old, is walking on the opposite side of the road to you, a little bit ahead, travelling in the same direction. None of this is out of the ordinary and you're chatting with your friends. A car squeals around the corner behind you and immediately, easily breaks the speed limit before sliding to a stop next to the girl. A middle aged woman jumps out and starts pummeling the girl with fists and forearms about her shoulders and head, all the while screaming unintelligibly. The woman then forces the girl into the car, gets in and drives off. All this takes about fifteen seconds. What do you think you'd have done? Anything? Imagine you were 14 years old when you saw it, and the girl across the road was a classmate. Does that change how you think you would have reacted? It's a true story. I knew the girl, and I knew the middle aged woman was her mother. I also knew that sometimes she didn't live with her mother. I did nothing. Well, nothing except discuss with my friends what we wished we had done, for the rest of the walk home. Nothing except stare in horror as a classmate was beaten. Frozen to the spot. And nothing afterwards, because I knew the woman to be this girl's mother. Though it was likely legal behaviour at the time, I still knew it was wrong. My friends and I, we longed to have had super powers to react and to protect. I think I felt as powerless as my classmate did. In a different way, of course, because I've never been subjected to what she was, and as I say it, I feel a crushing weight that you all might think I'm comparing my experience of watching with her of being the victim. No way. But I did feel completely, utterly powerless. Afterward that day I pretended it never happened, and I wouldn't be surprised if she did the same. I thought it would embarrass her if I mentioned it, so I didn't. I thought she wouldn't want anyone to know, so I told no one. And that's probably how she did think, because when people grow up with that, they think it's all their own fault. That they're a horrible person, otherwise why would awful things happen to them? She probably had it internalised and normalised. She was probably very ashamed. Toxically shamed. All this happened more than half of my lifetime ago. I still think about it often: probably about once a month, these days. It made an impression. I'm very haunted by the fact that I did nothing. It's cliche, but I wish I knew then what I know now. I wish I had known that the way to break through that shame wasn't to pretend awful acts never happened, but to recognise that they were indeed awful acts. To let her know that nothing she could possibly do would deserve being treated that way. That the beating was wrong and it wasn't her fault. That she didn't make her mother do that, no matter what her mother said. You can't "make" a person beat you - it's their choice. It's the aggressor's choice. Their emotions. Their actions. Their psychological baggage. Not the victim's. All the victim is guilty of, is stepping on a hidden landmine. But I didn't know then. I didn't know how important being a sympathetic witness is, but I know now. It's important for that child being scolded in the supermarket for singing too happily - though you may not feel you can step in, you can make eye contact with the child in a way that lets them know they're not bad. 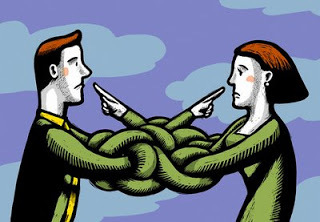 It's important for the person at your office who serves as your boss's scapegoat. It's important for that bullied kid at school to know that he's not to blame. And it's important to know, that even if you can't step in and stop something from happening, that a lot of good can come from letting the victim know it's not their fault. Like the Knight N Daze facebook page? I Love You, But I Don't Give A Rat's Bum! My Plants Live in Toilet Rolls?